Finding North and time by stars. 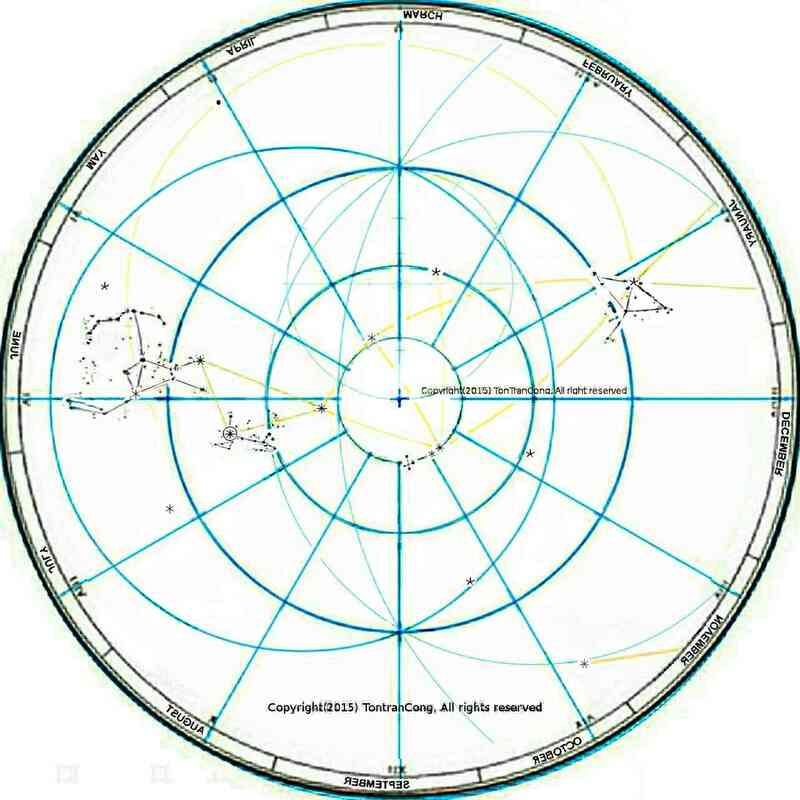 The declination circles on the Celestial spherical shell are similar to the latitude circles on Earth while the Right Ascension arcs on the Celestial spherical shell are similar to the terrestrial longitude arcs on Earth. They are marked in hours; 360 degrees correspond to 24 hours. The 0 hr Right Ascension is the R.A. of the Sun when it crosses the Celestial Equator at Spring Equinox on March 21st of every year. On that night the 0 hr ascension arc is (invisibly) lowest while 12 hr ascension arc is highest in the sky at 24 hr. On the other hand, angular distances can be accurately measured using only a compass divider having two straight legs and a protractor (or a clock face; each complete revolution of the hour hand sweeps 360 degrees, other angles are derived from that). Solar and Lunar diameters can also be conveniently used as small units of 0.5 degree for angles measurement. Most hikers can readily estimate angles by the widths of their fingers and hands when their corresponding arms are fully stretched (10 degrees corresponds to a slope of 0.174, and 6 degrees to 0.10). The stars to be used as the reference marks on the sky are Polaris (a bright star nearly right on the Celestial North pole), Vega (the second brightest star in the sky, 39 degrees from Polaris, with RA of 18 hr 36 m), Sirius (the brightest star in the sky, 106 degrees from Polaris, 74 degrees from the Southern Celestial pole, RA of 7 hr.). 2. REPRESENTING A SPHERICAL CIRCULAR SHELL HAVING STARS BY FLAT SHEETS OF MAPS. We don’t want to project images of the stars from the center of the Celestial sphere onto the flat sheets touching it. Doing so will require the observer to have his eyes at predetermine distance from the flat sheet maps to keep the shapes of star constellation correct. Date of maximum stay —–>> Right Ascension. 21 Jun Summer Solstice —>> 270 deg (18 hr) RA. 2x Lunar diameters are nearly 1 degree. 3x Lunar diameters are 1.5 . degrees. This may approximate the angle sustained by an index finger. The angle sustained by a closed fist, usually of more than four finger widths may correspond to about 10 degrees. This varies with individual observers. When angles sustained by hands are used near the zenith, the angle may increase by up to 30% due to the reduction in distance between the raised hand and the aiming eye. Frequent checks against known reference angles are necessary. Long observation of Celestial objects may produce the “zooming in” illusion where angles seems to be much bigger than their real sizes. This phenomenon is well-known with people observing Sunsets, Sunrises, Moonsets and Moonrises. Stars cannot be identified by only their relative brightnesses. Their brightnesses are hard to distinguish and may change with time and with Earth’s weather. Stars are positively identified by their relative brightnesses combined with their angular distances to nearby stars. 5. INVERSION PROJECTION AND THE NORTHERN HEMI-SPHERE. 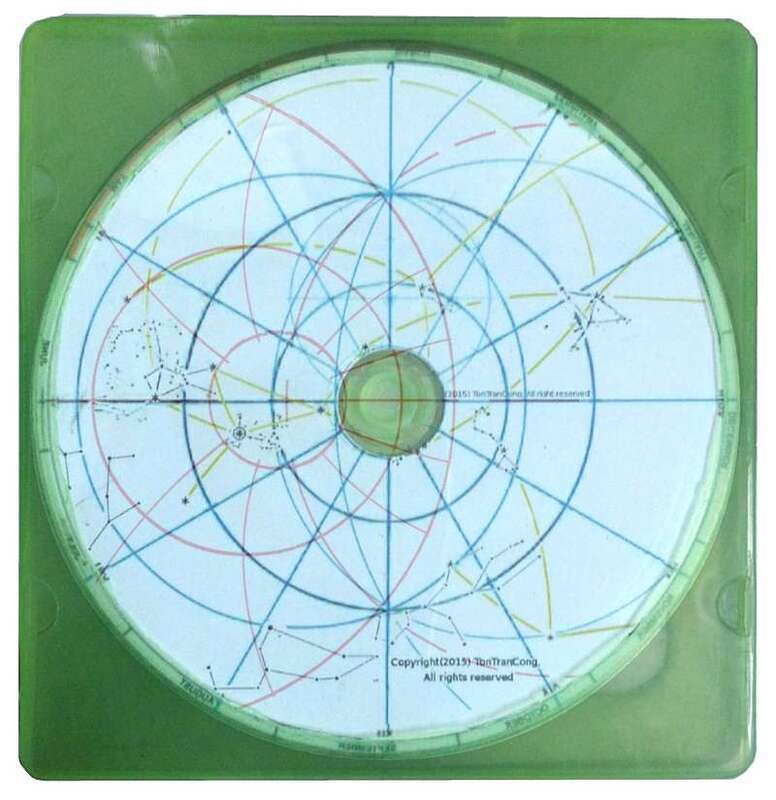 The concentric circles on the polar map represent the declination circle on the Celestial sphere. They are placed at angles of 30, 60, 90, 120 degrees from the Celestial pole. The non-concentric circle represent the circular path of the Sun on the Celestial sphere. Solar path is called the ecliptic. A dipper is a liquid transfer tool made of an open cylindrical container (a tubular container, a cup) with a long, nearly vertical handle and is used to take liquids out of their deep, long necked jars. An ordinary spoon or ladle would not be able to take liquids out of such long necked jars as the steep exit angle would spill the liquids back. Each of the dippers outlined by the stars here has a deep container (a cup) with opening diameter equal to only half its depth. The Big and Little Dipper groups of stars look like a pair of such dippers. The top halves of their handles are nearly parallel and point in opposite direction while their containers open outwardly away from each other, in directions 120 degrees apart (The handle of the Little Dipper curves backward by 60 degrees). Each Dipper has seven stars, four close stars at the vertices of a quadrilateral, or quadrangle, outlining the deep liquid container and three stars outlining the long vertical handle. The front (anterior) part of each Bear is well camouflaged and requires over-imagination to see. The word Dipper may be easier for description. 6. Positively identifying Northern stars. Figure 1: Bootes Arcturus and the Summer Triangle formed by Vega, Deneb and Altair. The star map is from the Inversion map for Northern Celestial hemisphere, aligned for May 21st . Figure 2: Mid-point of Bootes Arcturus and Vega at the center of a hemi-spherical sky view. Sirius and Vega are brightest stars in the sky. As the RA of Sirius (brightest star) and Vega (2nd brightest) differs by 12 hrs, they can never be seen together therefore cannot be distinguished only by their relative brightness. They are identified mainly based on their distances to their identifiable neighbors. Bootes Arcturus and Vega are two brightest stars in the Northern Celestial hemisphere and both are brighter than any other star within 150 degrees distance from both of them. The great arc from Bootes Arcturus to Vega is 55 degrees long, attains highest elevation around May 23rd and is 60 degrees anti-clockwise from the intersecting constant RA arc pointing North. Bootes Arcturus leads and has only one less bright star Spica close to it (within 35 degrees distance). Vega follows and has two less bright stars Deneb and Altair close to it (within 35degrees distance). The line Bootes Arcturus-Vega turn right by 30 degrees at Vega and continue as the line Vega-Deneb. Deneb is the next brightest star within 25 degrees from Vega. Besides Deneb, Altair is the next brightest star within 45 degrees from Vega. The line Vega-Altair is 70 degrees in the anti-clockwise direction from the line Vega-Deneb. Arcturus alpha in Bootes (19 degrees, 14 hr), Vega (39deg,18hr36m), Deneb (45deg, 20hr41m) and Altair (9 degrees, 19.8 hr) have been identified. 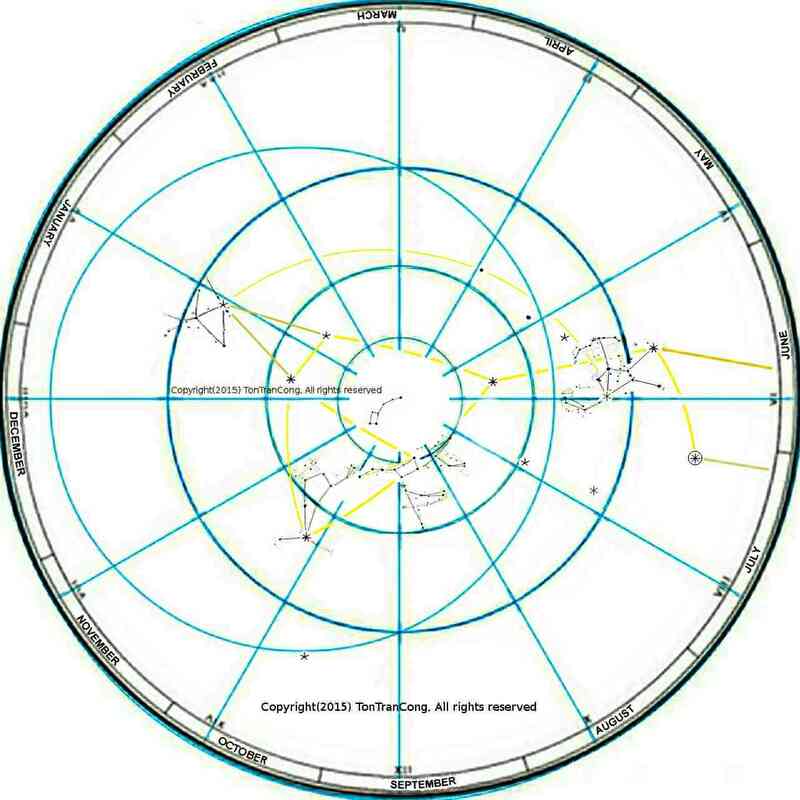 Figure: Sky map of the Southern Celestial hemisphere (Inversion map, this map shows only 20 brightest stars of the sky)The small circle on the top half, on the 24hr RA, of this map is of the same size as a great circle of the Celestial Sphere used in this Inversion projection. The circular arcs or circles centered on the 18hr RA radius are the images of some inclined great circles on the Celestial sphere. 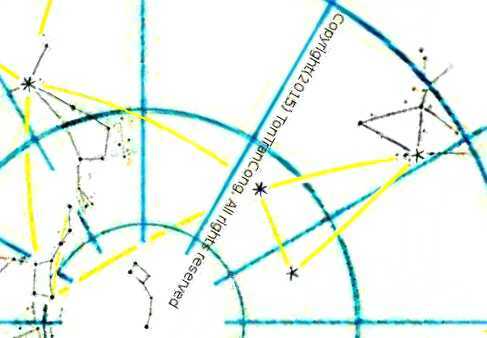 Figure: Sky map (Inversion type) of the Southern Celestial 3/4-sphere showing only 20 brightest stars and some constellations. The Southern Celestial pole has no noticeable bright star. Near to it (or not so near, at 30 degrees distance!) there are two bright Pointer stars (Rigil Kent, or alpha Centauri, is the trailing but very bright star and Agena, or beta Centauri, is the leading but less bright star, leading by a 5 degrees distance). Both are on the circle of 60 degrees of declination. Near to the opposite side of this circle there is also another bright star Achernar. Before the Pointers go lower than the Celestial pole, they point vertically downwards with the Celestial pole 30 degrees on their left. On the other side of the pole, at the same distance of 30 degrees there is a nearly as bright star Achernar (meaning “the end of the river”). The line of alpha Centauri-Achernar is 63 degrees long and is 105 (180-75) degrees in the clockwise direction from the Pointers’ direction. Achernar is the brightest star in the disk of 30 degrees radius centered on it. Achernar can be unambiguously identified and it is still in the sky for another 11hr after a-Centauri goes lower than the Southern Celestial pole. Achernar (meaning “the end of the river”, also named alpha Eri, 01h 37mRA, 57° degrees South , 0.46 apparent magnitude) has been identified. The mid-point of aCen-Achernar is close to Southern Celestial pole. Rotation of this line by 10degree counter-clockwise around aCen or clockwise around Achernar places the mid-point on the Southern Celestial pole. The line of Achernar-Southern Celestial pole is 33 degrees long and is 90 (180-90) degrees in the clockwise direction from the Achernar-Altair direction. 8. Positively identifying Southern stars. Only the triplet of three stars (Sirius, Canopa and Orion Rigel) can satisfy the above descriptions and it is unique.The triplet forms a triangle (Sirius, 37 deg, Canopa, 50 deg, Orion Rigel, 30 deg, Sirius). 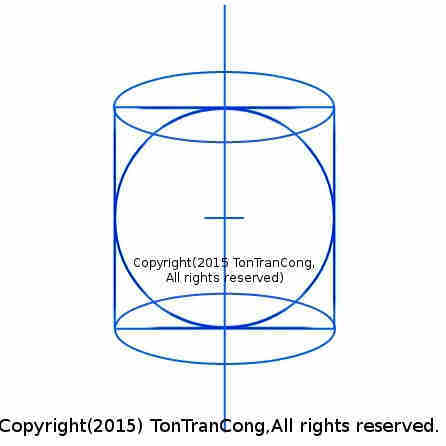 The vertices are cited in the anti-clockwise direction, begining and ending with the brightest star. The triplet makes a flattened nearly isosceles triangle. From Sirius and Canopus, it is easy to identify the Pointer Stars (alpha and beta Centauri) near the Southern Celestial pole. The line Sirius-alpha Centauri(Rigil Kent) is 90 degrees long and 20 degrees in the clockwise direction from Sirius-Canopus while Sirius-beta Centauri(Agena) is 87 degrees and 22 degrees. Both of alpha Centauri (Rigil Kent ) and beta Centauri (Agena, dimmer and leading it by 4.5 degree distance) are on the 60 degrees South declination circle. Their difference in RA is 36 minutes and their angular distance on the Celestial sphere is nearly 4.5 degrees (= 2arcsin(2cos60sin(8.97/2)) =4.481deg.). This is about 4 finger widths or nearly the width of a closed fist on a stretched arm. They are two bright stars near the Southern Celestial pole and point to the Southern Cross group of stars. Extending the pointer line alpha-beta Centauri (Rigil Kent-Agena) to 17 degrees (to 3.5 times its original length) from alpha Centauri (Rigil Kent) reaches the top star of Southern Cross (group of 3 bright and 1 dim stars forming the 4 extreme points of a Christian cross, with a shaft length of 6 degrees, cross bar length of about 4 degrees) . The Southern Celestial pole is of equal distances (of about 30 degrees) to the two Pointer Stars and the intersection of the Cross. It is 90 degrees in the clockwise direction from the Pointers’ direction. The Southern Celestial pole is thus about 4 and 1/2 extended length of the shaft below the bottom of the Cross. The line alpha Centauri (Rigil Kent)-Canopus is 50 degrees long and is 40 degrees in the clockwise direction from the pointer direction alpha-beta Centauri (Rigel Kent-Agena) .The line alpha Centauri (Rigel Kent)-Sirius is 85 degrees long and is 20 degrees in the clockwise direction from the pointer direction alpha-beta Centauri (Rigel Kent-Agena) . 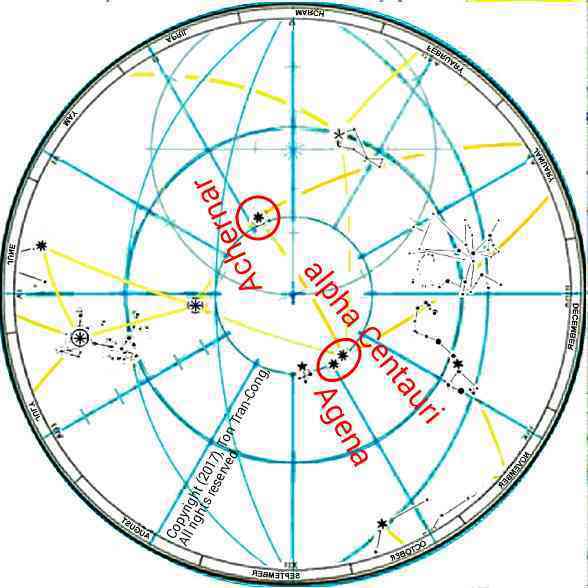 The line alpha Centauri (Rigil Kent)-Altair is 95 degrees long and is 172 degrees in the counter-clockwise direction from the pointer direction alpha-beta Centauri (Rigel Kent-Agena). Within 30 degrees distance from it, Altair is the brightest star. It is thus easy to identify the tropical Altair using the Southern Cross Pointer Stars in order to use it before the Pointers hide themselves under the Southern horizon. 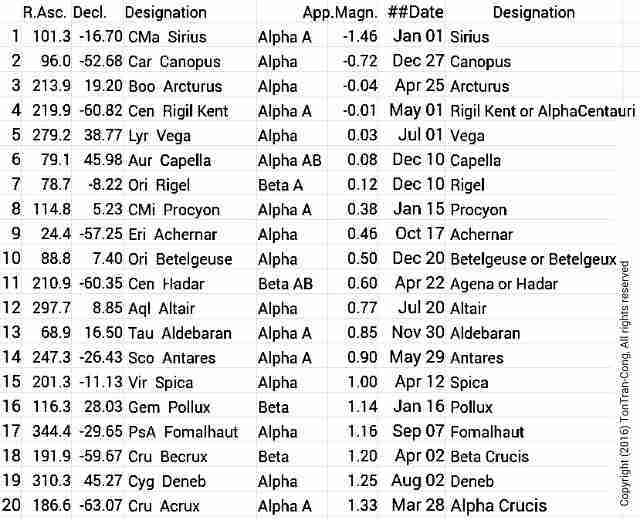 Figure 1: List of 20 brightest stars. 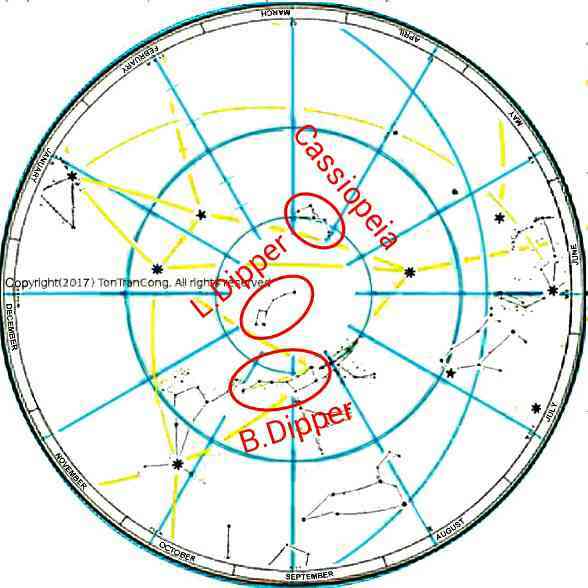 Figure 2: A real dipper and insets for Big Dipper and Little Dipper. 10. Notes on identifying stars. 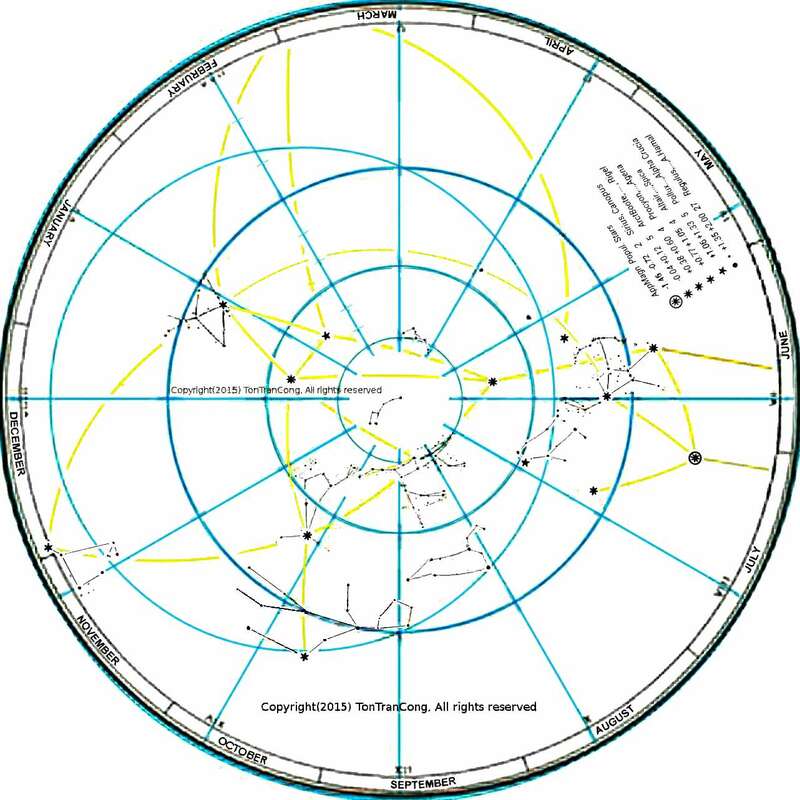 Figure 1: Mercator sky-map, for upside down reading, of brightest stars and great circle arcs to their neighbours. The term “distant vertex” of a triangle denotes the vertex facing the shortest side of that triangle. 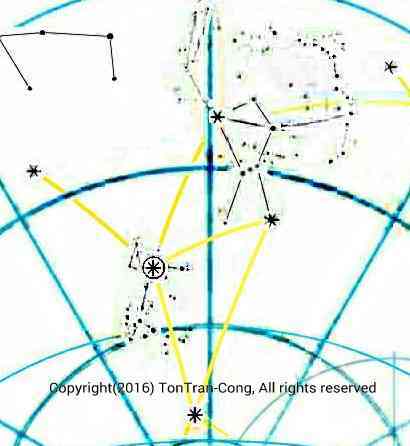 Around September 23rd, Southern Cross and its two trailing Pointers are lowest in the sky and navigators in the Southern tropical zone cannot see them. However, they can instead use Achernar (opposite the Pointers across the Southern Celestial pole) or either of or both of the setting, bright tropical star Altair (9deg, 19hr50) and the rising, bright tropical star Orion Rigel (-8deg, 5.2hr) for navigation. At least one of these two are 12 degrees above the horizon at that time. Bright, late rising mid-declination Canopus (-53deg, 6.4hr) may also be used. Vega (of July 1st) and Bootes Arcturus (of April 25th) are two brightest stars in the Northern Celestial hemisphere, being 55 degrees apart in the sky and both are brighter than any other star within 150 degrees distance from both of them. Vega has two bright stars Deneb and Altair close to it (within 35degrees distance) whereas Bootes Arcturus has only one bright star Spica close to it (within 35degrees distance). Therefore within a 55 degrees distance around Vega, one of the two brightest stars in the Northern hemisphere, the three other brightest stars are Bootes, Deneb and Altair. They surround Vega and form a slender anti-clockwise triangle with Bootes being the distant vertex and Vega being near to its center of gravity. Within the distance of 35 degrees around Bootes there is a uniquely identifiable bright star on the other side of the Celestial equator, that is Spica (-11.1deg decl., 201.3deg 7hr25 RA or April 12th). The line Bootes to Spica is at 30 degrees counter-clockwise from line Bootes to Southern Celestial pole. Within 25 degrees distance around Vega, the next brightest star is Deneb (45 deg, 20 hr 41 m), a star 70 degrees on the trailing side of its Celestial North. Within the second larger distance of 35 degrees around Vega there is another uniquely identifiable bright star, which is Altair, at 40 degrees on the trailing side of its Celestial South. Altair(9 deg, 19hr 50)’s name has foreign origins (Al Nesr Al Tair, in Arabic; Vultur volan, in Latin). 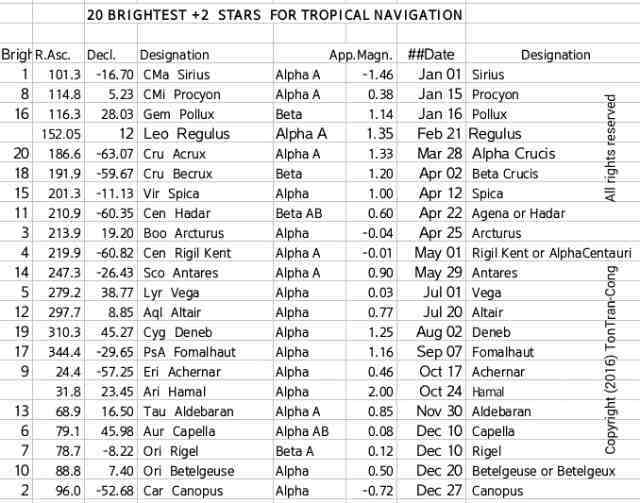 People in the tropic can use Altair around July 20th and Sirius (brightest star) around Jan 1st for identifying neighbouring stars and for navigation. Altair and Sirius stars are 13 hr apart in R.A. so at least one of them will be visible in any tropical or temperate sky except for 1 hr in any continuous 24 hr hours period. Sirius (meaning glowing, scorching; at -16 degrees, 7 hr), is the brightest star, or more accurately binary star system, in the sky. It is in the Dog group of stars near to the trailing foot of Orion. It is a useful star for identifying its neighbours. People in the tropic can use Altair around July 20th or Orion-Rigel around Dec 10th or Vega (very bright star in the North) around July 1st or Sirius (the brightest in the South) around Jan 1st and for identifying neighbouring stars. Sirius simplifies the identification of its 4 neighbours which are in the top 10 brightest stars. Sirius is at the center of a broom head, surrounded by 4 neighbours outlining the extremities of the broom. Canopa is the second brightest star and is at the end of the broom handle. The angled line (Orion-Rigel, 18 degrees distance, Betelgeuse, 25 degrees distance, Procyon) outlines the extremity of the broom head. The vertices are 3 bright stars on a 100 degree counter-clockwise circular arc of 25 degree radius, centered on the brightest star Sirius. The bisector of the 60 degrees anti-clockwise angle (Betelgeuse, Sirius, Procyon) points to the North Celestial pole while Sirius-Canopa points in its opposite direction, at the Southern Celestial pole.The trailing half of the broom head is an equilateral triangle (Sirius, Betelgeuse, 26 degrees distance, Procyon, Sirius, in counter-clockwise order). Its center of gravity is less than 2 degrees South of the Celestial equator and its base Betelgeuse-Procyon is a constant declination arc. Orion’s central belt star (0 degree, 5.5hr) is right on the Celestial equator. It readily gives the accurate North direction by my method . It is a star of December. However it is not the brightest star in the Orion group. The brightest star of Orion is Rigel, at Orion’s leading (Westward) foot and the second brightest is Betelgeuse, at Orion’s trailing (Eastward) shoulder; all other stars of Orion are much dimmer. The line joining these two brightest stars of Orion is about 25 degrees long and forms with the line of 3 regularly spaced (much dimmer) belt stars of Orion the distinctive shape of two diagonals of a slender rhombus. The line of the 3 belt stars has 1/6 the length of and is at right angle to the line Rigel-Betelgeuse; its extension also goes through Sirius. The line Rigel-Betelgeuse is oriented 30 degree anticlockwise from its North pointing RA semi-circle. The two shoulder stars of Orion are almost right along the Leading-Trailing direction. The dagger stars of Orion are right along the RA semicircle. Procyon is right behind Orion group of stars and is a mid-January equatorial star. The next bright equatorial stars are Spica and Bootes Arcturus, they are behind Procyon by 6 hours. Before Altair (9 deg, 19.8 hr) sets nearly at 279 (=270+9) degrees in the West there is already Orion Rigel (-8 deg, 5.2 hr) rising at nearly 98 (90+8) degrees in the East (The two stars are almost setting and rising at opposite directions.). This Orion Rigel is only 24 hr +5.2hr -19.8hr = 9.4hr = 141 degrees RA behind Altair. So at least one in this pair (Altair, Orion Rigel) are above 12 degrees (=0.5*(180 – 141)* cos 30) in elevation to tropical navigators to be used as navigational stars. The line Deneb – Celestial pole is 45 degrees long and is 90 (=180-90) degrees in the counter-clockwise direction from the line Deneb – Vega. The line Deneb – Capella is 80 degrees long and is 120 (=180-60) degrees in the counter-clockwise direction from the line Deneb – Vega. Rotation of this line by 30 degree or clockwise around Deneb or counter-clockwise around Capella places the mid-point on the Southern Celestial pole. This pole is of equal 45 degrees distances from both stars. 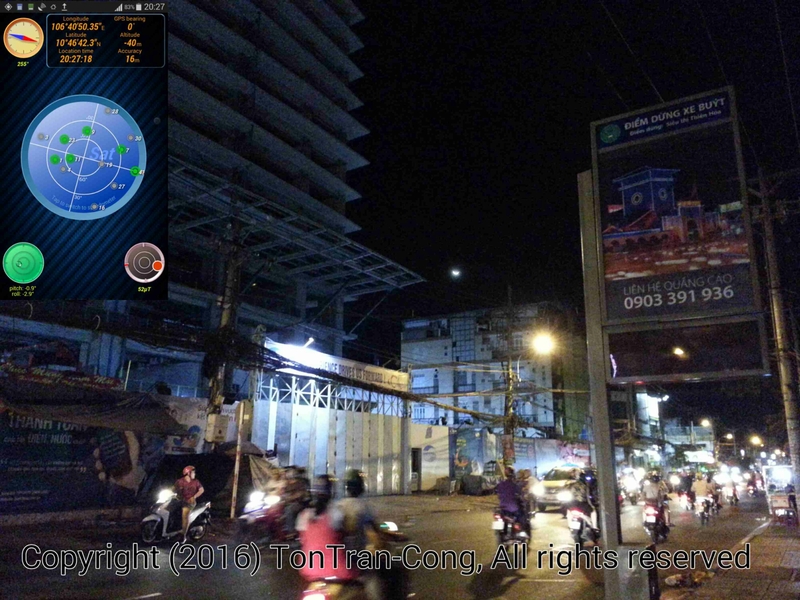 The tropical September mid-nights have no bright star near to the zenith. Navigators have to use bright stars on the West (including the pair Fomalhaut-Deneb) early in the night and then switch to bright stars on the East late in the night. Fomalhaut, 30degrees South declination, is a September star. Fomalhaut and Deneb are separated by about 75 degrees distance, straddling the Celestial equator. The North and South Celestial poles are respectively 90+30 and 90-30 degrees from Fomalhaut. 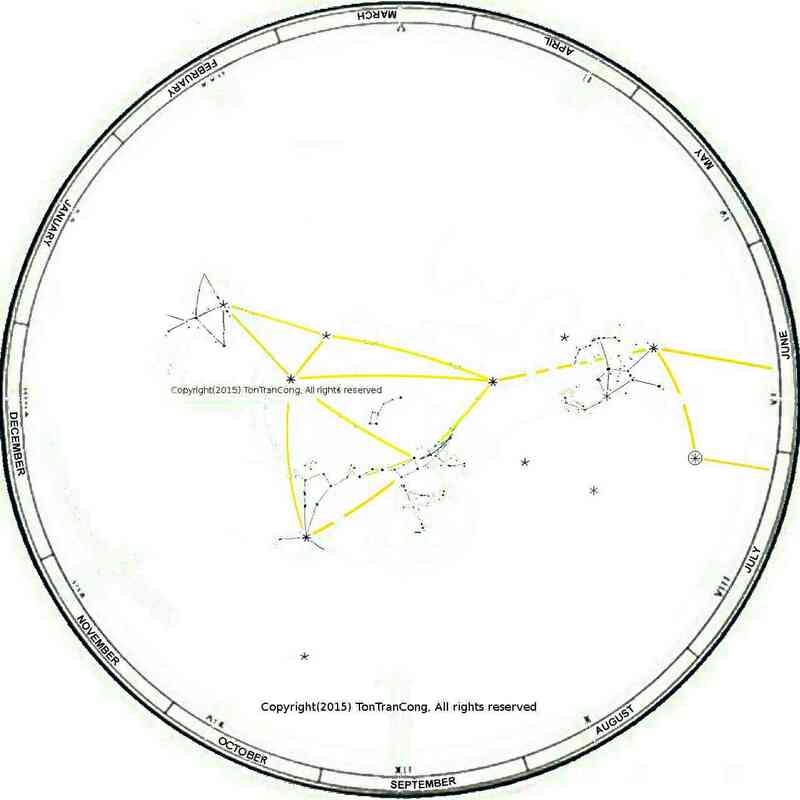 Figure: Using a star map on the 21st of July, the selected date is on the rim. Align the map so that the Sun on the map be on the bottom radius (or Right Ascension) line. The line of Right Ascension 12 hr from it is the meridional line for midnight of that day. Stars on this RA line should attain their highest elevations at midnight. Figure: Finding North direction and time by any star is similar to that by the Sun but with the STAR INSTEAD of the Sun. Figure: Finding North and time by any bright star. Lead on time by the Sun = Solar Time – Time Relative to star = RA star – RA sun. The difference star RA – solar RA must be ADDED to it to give local time with respect to the Sun (a star with larger RA will rise later than a star with smaller RA). 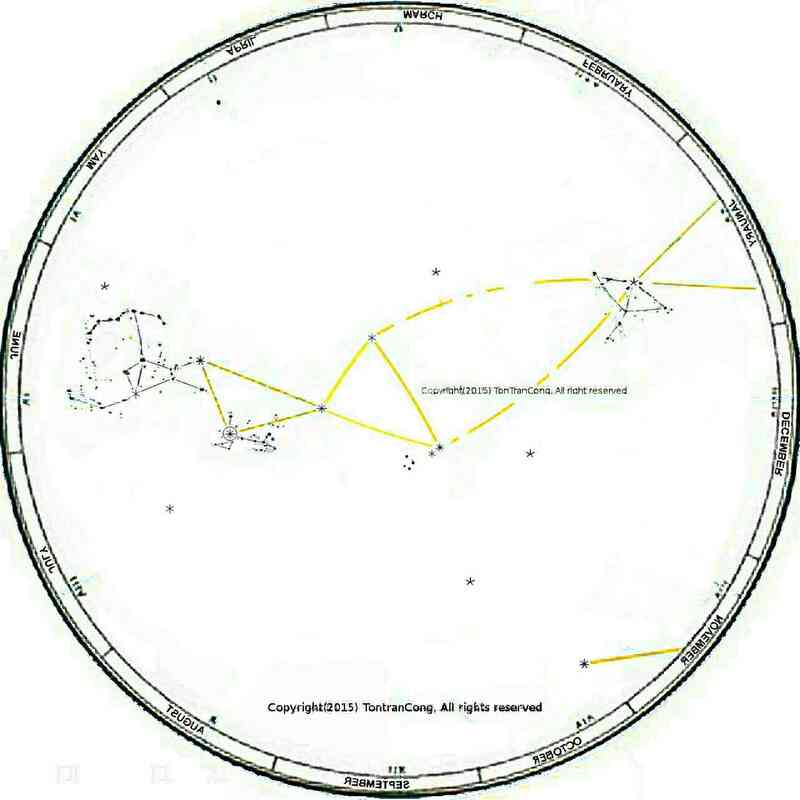 2- Alternatively, the shapes of identifiable constellations can tell how the Celestial sphere is orientated, and this may easily give information on both direction and time to people who watch the Celestial sphere nightly and have learned it by heart (Traditional sea fishermen in Vietnam have such memory for positions at various times for bright equatorial stars/constellations in the Celestial sphere).
. tonytran2015, Finding North direction and time using the Sun and a divider, http://www.survivaltricks.wordpress.com/, 06 May 2015. Finding North direction and time accurately from the horn line of the Moon. Here I add two more steps to the common horn line method for the Moon to obtain more accurate North direction and time from its horn line. 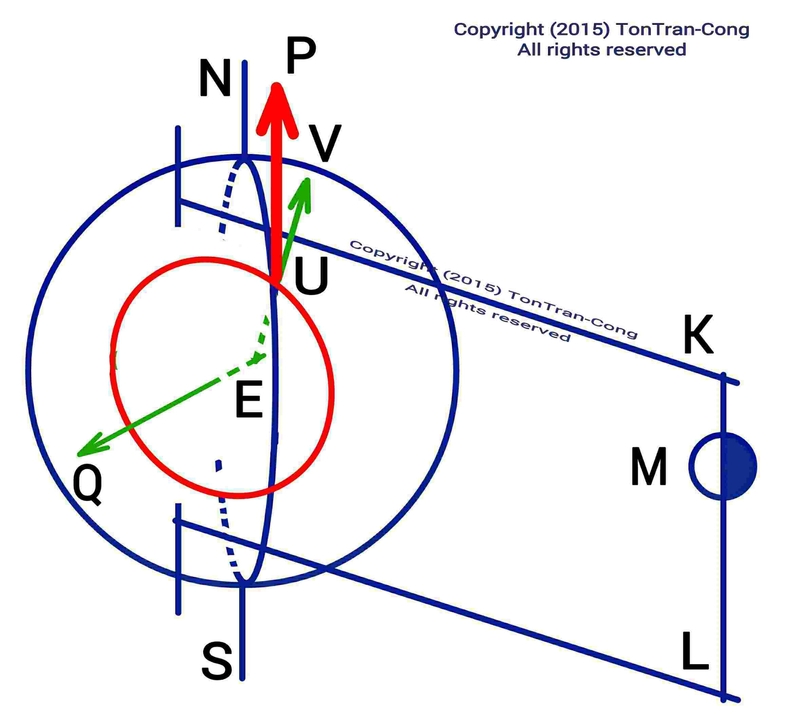 The modified method uses position of the Moon, shape (phase) of the Moon, solar declination and user’s latitude to work out North direction and rough local time. 1. Basic information on the Moon for navigation. The Moon is a satellite of the earth. Everyday Moon-rise and Moon-set time is retarded by about 50 minutes. This allows the Sun to travel further on its journey every subsequent night. Therefore after full moon the partial bright side stays on the East (trailing) side and dark crescent appears on the West and dark area gets fatter daily until the whole moon is dark. Similarly, from new Moon a bright crescent appears on the West and grows fatter and bright area gets fatter daily until full Moon is reached. From the shape of the Moon, it is easy to say how late the Moon is trailing the Sun (new Moon trails by 0 degree and 0 hour, new half-Moon by 90 degree and 6 hours, full-Moon by 180 degrees and 12 hours, and late half-Moon by 270 degrees and 18 hours .). The shape and the position of the Moon allow some guessing of its trajectory for the night. The Moon completes its orbit in space in 27.321 days, and it completes one full revolution on the Celestial sphere in that time. Its angular velocity on that sphere is 1/27.321 (rev/day) = 0.036601 (rev/day) . The Sun apparent travel on the ecliptic takes 365.256 days. Its angular velocity on the elliptic is 1/365.256 (rev/day). The Moon revolves on the Celestial sphere faster than the Sun by an angular velocity of 1/((1/27.321)-(1/365.256)) = 1/29.530 (rev/day). When the Sun is one full turn ahead of it, the Moon will catch up, and they will be both in the same direction again on the Celestial sphere after a period of about 29.530 days. So the intervals between consecutive full Moons will be something like a pattern of (30days, 29days). By keeping records of previous full Moon nights people know it is a WAXING or WANING Moon. The simple Waxing-Waning rule is that the bright side of the Moon is on the West for waxing and East for waning Moon. It is natural for people to desire to use the horn line, which is the line connecting the two horns of the Moon, to draw the North South direction. However it has been found that the intersection between the horn line and the horizon does not accurately give the North direction. Here we find out the reasons for that inaccuracy and show a more accurate method of using Moon’s horn-line. It may be easier for some readers to first read step 5 then come back to read steps 2, 3 and 4. CAUTION: The horn line of the partial Moon can point far away from the terrestrial principal North or South directions. The whole Celestial spherical shell rotates around its two Celestial poles. The Sun moves slowly on that sphere on a great circle called the ecliptic. Its distance to the two opposite Celestial poles varies periodically, and its distance to the Celestial equator is call the declination of the Sun. You can make a rough sketch of this declination from the principal values and estimate the declination for the current day. 3. The horn line is not easily transformed to the ground meridian line. Figure: Panoramic view of the travel of a partial Moon in the sky. The Celestial axis is always at right angle to the path. This picture is for the winter, with the Sun in the other hemisphere and the bright side of the Moon tilts toward the ground. In the summer, it tilts toward the sky. The horn line is at right angle to the plane containing the very slender triangle formed by the Earth, the Moon and the Sun but the Celestial axis is at angle of (90-23.5) degrees to that plane. So the horn line usually form an angle of that size to the Celestial axis. Near to half-moons the horn line is easily defined, and it is also easy to see that the projection of the Celestial axis onto the half-moon makes with it an angle equal to solar declination. On top of those complication, the Moon also has its own declination and an observer has additional difficulty working out the direction of the horn line as it is usually not at right angle to his line of view. 4. Twisting the horns of the partial Moon. Figure 1: Moon phase chart for a Solar declination of (-20) deg (South). At half Moon, it is possible to twist the horn line about the line of view to generate a line KL parallel to the Celestial axis. The amount of twisting is opposite to the declination angle of the Sun. 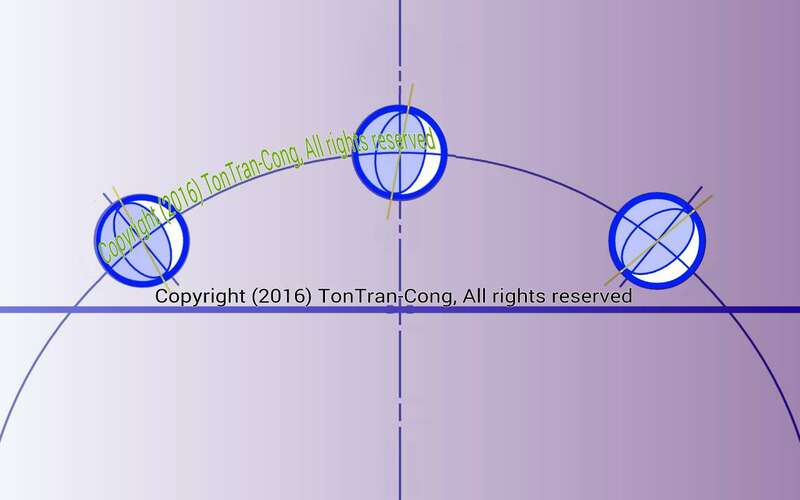 Similarly, when the angle Sun-Moon-Earth is about 90°+/-30° (=120° or 60°) the amount of required twisting is about 0.85*declination of the Sun. full or no-Moon requires no twisting. Remember that if the Sun is into your hemisphere (in your summer) the bright side of the half Moon has to be twisted downwards (toward the Celestial equator) by an angle equal to the solar declination angle. The opposite should be done in your winter. This correction here already causes a difference between the results from the old horn line method and the current method. There will be another difference caused by drawing the “spear line” parallel to Celestial axis in the next section. The required twisting on the horns of the Moon varies sinusoidally with time and peaks to the values of minus/plus Solar declination when the Moon is half-full. 5. Finding North direction from a Celestial North South line seen on the Moon. Observing a Celestial axis KML drawn on the Moon: U is observer, E center of the Earth, N terrestrial North pole, S terrestrial South pole, M Moon, UV local vertical, KL a line parallel to Celestial axis, EQ normal to plane UKL, UP a line parallel to Celestial axis. The red circle through U is the intersection between the plane UKL and the Earth’s surface. (|angle /(PU,KL)| <90° ) and (angle /VUP = 90 deg. – latitude angle). The line UP is then parallel to the Celestial axis, and its projection on the ground gives the local North South (meridian) direction. ( angle /MUV < angle /MUP ) and (angle /VUP = 90 deg. – latitude angle). For Southern latitudes draw UP’ close to the direction of LK (PUP’ is a straight line). 6. On the ground view of the horn line method. Figure: Finding out North direction more accurately using horn line. On half-Moon nights, when the angle Sun-Moon-Earth is 90°, twist the horn line by the declination of the Sun to generate on the Moon the line KL parallel to the Celestial axis, and similarly, when the angle Sun-Moon-Earth is about 90°+/-30° (=120° or 60°) the amount of required twisting is about 0.85*declination of the Sun. When properly carried out, the plane UKL always makes with the horizontal plane an angle not less than the latitude angle. The line KL is the observer’s view of the Celestial axis. All lines co-planar to UKL generate the same view to the observer! 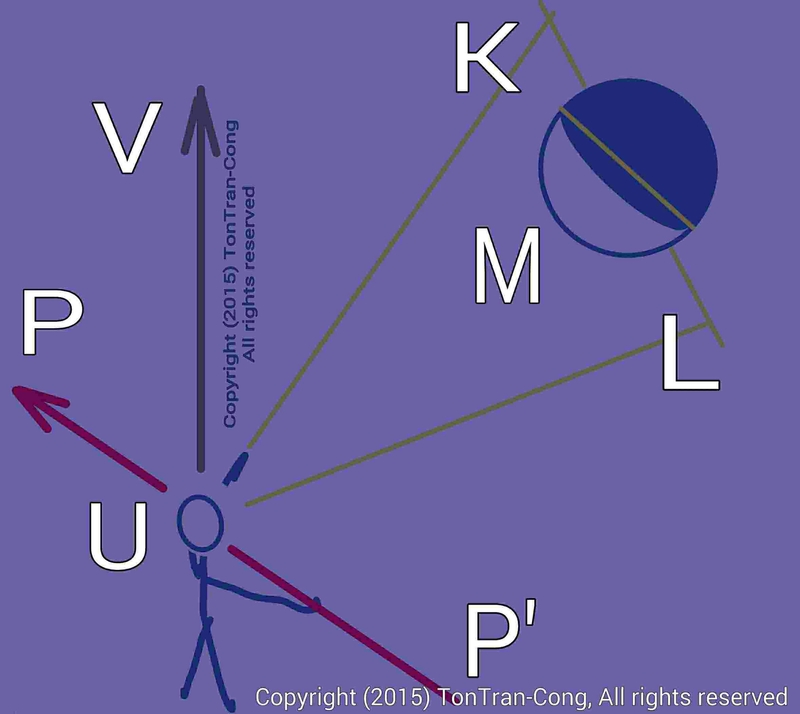 Draw a “spear line” PU co-planar to UKL and spearing the ground at an angle equal to latitude angle. The spear line PU so obtained is then pointing exactly along the Celestial axis, towards the lower Celestial pole. The projection of PU onto the ground gives the terrestrial North-South line. North direction is then found. 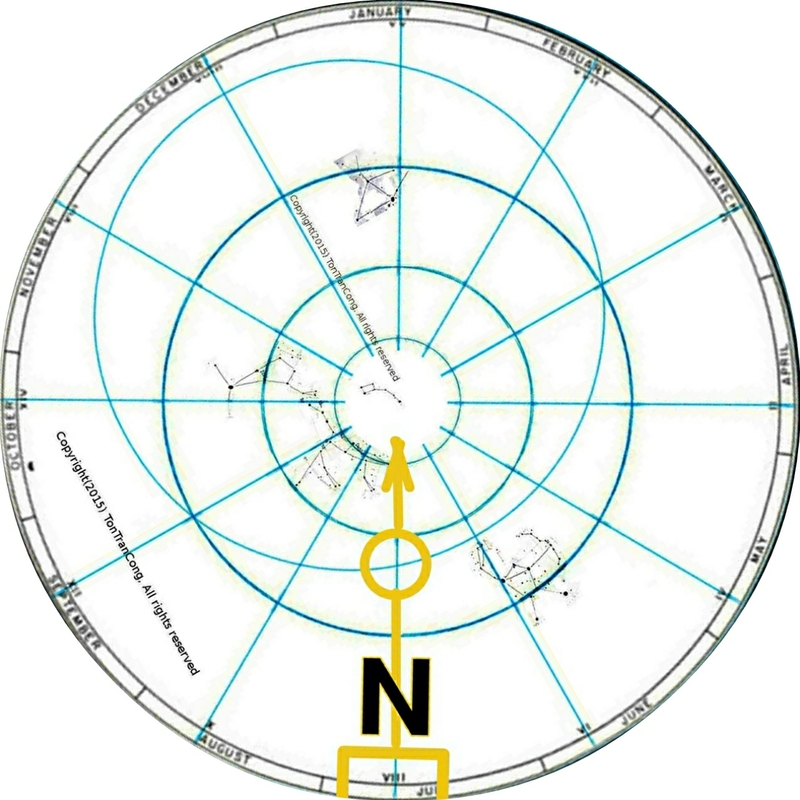 When the Moon is high in the sky and the plane UKL is steeply inclined to the local horizontal, the lower end U of the spear line is nearer to the line KL than its upper end P.
The intersection line between the plane PKL and the ground surface is generally NOT in the North-South direction unless the observer is on the terrestrial equator circle. The drawing of the spear line PU cannot be by-passed in this method. 7. Summary of steps in this method. f. Projecting the Celestial axis onto the ground surface to obtain the terrestrial North-South direction. New users to this method should initially only use it as a double check for another method using the position of the hidden Sun, given earlier as part 1, in a previous Instructables article . The agreement between the two methods would make users confident on their results. 8. Avoiding hasty and perilous conclusions when using the horn line. Figure: A rare (or not so rare?) failure of the simplistic, traditional horn line method. The horn line intercepts the horizon near to the terrestrial North (wrong by 180 degrees!) in a place in Northern hemisphere. The traditional horn line rule really requires amendments. At latitude less than 28 degrees, the horn line may point to Northern skyline at high Moon although most of the times it points to Southern skyline ! There is a peril of being sent astray by 180 degrees for unreserved navigators. At high Moon the horn line only gives North South direction near to equinox times ! The error can be due East or West by the declination value of the Sun. If the steps for using this method seem to be too complex, the Moon navigators may have to accept reduced accuracy from the Moon and use only Waxing-Waning rule in combination with the stars to navigate ! There is a third part to this topic, with the title “Finding North direction and time using the Moon p3- Moon surface features”. It is possible to work out accurately North direction from the horn line of the Moon. The twisting of the horn line and the drawing of the spear line PU are two additional steps of this modified method. Finding North direction and time using the hidden Sun via the Moon . Posted on July 6, 2015.